Pictured above with his wife, Georgette Berger, Rene Magritte has become a familiar name in history as one of the most influential surrealists in modern art. Born November 21, 1898, in Lessines, Hainaut, the Belgian native took interest in painting around the age of twelve. His family lived in Gilly for a few years, where younger brothers Raymond and Paul were born, before settling in Chatelet in 1904. At age of fourteen, his mother drowned herself in the Sambre River. Influenced by her death, many of Magritte's early works featured the river's landscape. One of his more famous paintings, "Les Amants" (seen below) displays a couple with clothes masking their faces. Supposedly, his mother was found with her dress obscuring her face, possibly provoking the queer images. However, it is not truly known what directly inspired the majority of Magritte's styles, who replicated many of the same components in his pieces. Oddly enough, he specifically reproduced flames, green apples, covered faces, bowler hats, and a flying bird in different pieces, that created deep emotional reactions, despite variation. Throughout the course of his career, beginning during his short-term studying at Musée Royal des Beaux-Arts, Magritte experimented with different mediums. He attempted both Cubism and Futurism after abandoning the instruction he was forced to follow at school; However, the aspiring young artist had yet to find a style he truly felt content with. Many masterpieces later, Magritte discovered the beauty of surrealism, that is, capturing the everyday object, action, or people in a foreign setting. In comparison to the former messy modern approaches of flamboyant women, surrealism appeared structured and stylized. 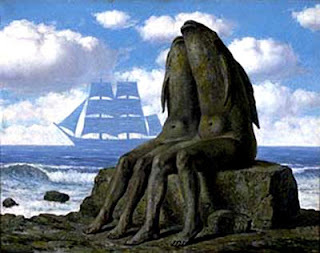 As Magritte continued to experiment, he expressed similar, repetitive concepts that challenged the conventional idea of "unique" art. In his early career, Rene Magritte worked as an advertisement designer, in which the repetition of structure may have established his unique idiosyncratic take on Surrealism later. In French culture, style is of utmost importance for everyday life. His simplistic view on a complex design pallet is a trademark French characteristic as well. He expressed concepts ranging from romantic to melancholy. Variations of the natural world, such as "Sirens" (below), have encouraged philosophy, literature, and all other forms of artwork that decorate the country of France today. By sparking this specific style, Magritte's themed work contributed to the rise of Surrealism in the 1920's. He painted naturally, from men and women to the lovely fish displayed below. Settings were made up of simple colors, pastoral or painted. His structure was polished, yet realistic, similar to 1900's adds. However, something was always uniquely different, detaching the piece from a "real" perspective. Over and over again, he would display the same people, for example the middle class man in bowler hat, posed in odd scenarios. He appeared to be expressing the idea that there is more to a man than his face. In other portrayals, however, concepts were presented concisely, while evoking deeper meaning. "La Clairvolence" captured a man painted a flying bird on his canvas (another Magritte trademark) using an egg to model. What one concrete object may seem to be, in truth, possess a different form. The famous, "The Treachery of Images" would be another example of this tangible concept. Surrealism as a whole defined the greater depth in sight. Even those uninterested in the concept of modern art can explore the emotional realm of this artist's work and take note of pure ingenuity. Rene Magritte's contribution to artistic society would prove to reach minds everywhere with a new concept to the old expression of surrealism. I did Magritte last year :) You did a great job of showcasing some of his most famous (and strange) works.I also liked how you mentioned the influence of his mother's death on so much of his work.